If you need the services of a court reporter to conduct a deposition or legal proceeding in Noble County, Indiana, see below for courthouse information, lodging and dining options, deposition venues, and more. Schedule your deposition with Smith Reporting and there are no mileage fees, except when the proceeding is not ordered transcribed or the witness does not appear. Finding a location to conduct your deposition can be time consuming. Let Smith Reporting do the work for you. With our 30 years of experience, we have developed a network of contacts all over the state of Indiana that allow us to reserve a venue with ease, usually at no additional charge to you. The Noble County Convention & Visitors Bureau website has an excellent list of lodging and dining options. The current courthouse is the third built on the site. 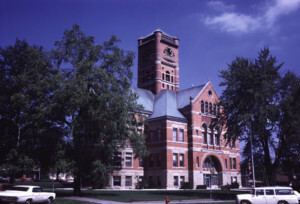 It was constructed in the late 1880s out of brick and limestone, and is listed in National Register of Historic Places.